Medical billing is certainly an interesting business. I started performing medical billing and coding way back in 1986 when billing was much simpler than it is now. Each year billing has involved numerous changes and much more sophisticated work. Today, billing and coding requires ongoing education to remain current with all of the rules and regulations from government payers to private insurance companies. I have 19 employees. Each employee has a computer workstation connected to large servers. At each work station is a phone for incoming and outgoing calls. The billing company provides coding, billing and collection services for radiology groups, pathology and primary care (internal medicine, family practice). Each day, the first order of business is to turn on the servers and all of the computers. Routine checks are performed to make sure every computer is working without problems and communicating with the servers. The first part of the day is devoted to collecting billing information from the medical practices. For some of the practices the information is available on paper and must be picked up from the offices. An employee visits the internal medicine and family practice offices to collect paper billing information. Another employee checks incoming electronic mail for billing information (facesheets) and reports from radiology and pathology. The facesheet is a hospital term because it was the first piece of paper on a chart. The facesheet has all of the patient's demographics including insurance information and generally the medical reason for the visit. I have five employees that are dedicated to radiology billing and coding. Radiology has a large volume of patients with multiple exams. 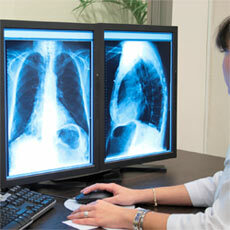 Radiology billing involves both hospital work and private offices. The volume for two separate practices may exceed 300 exams per day. As the radiology work comes in electronically, I divide the work by insurance type. 2 employees will be assigned all of the Medicare work. The 3rd employee will have all the Medicaid and Tricare (military) work. The last two employees for radiology will work with commercial insurances and self-pay. I prefer that work is divided like this to allow the employees to stay in a rhythm instead of switching back and forth. Most insurance companies have unique rules. Medicare patient information is reviewed to verify that all required information is available. A valid Medicare number is vital to the billing process. For more on Medicare, see What does Medicare cover? Fortunately with Medicare patients, many have received previous services. The information is already present in the system. The employee verifies that it is still the correct information, and if it isn't, makes corrections. When information is missing the biller calls the hospital or office to obtain that information. Medicare patients or recipients are told not to give their Medicare information over the phone and we abide by that rule and do not contact patients. The same work is provided for all of the insurance types. The radiology report of the provided services is submitted to us with the billing demographics. Many times the ICD9 (International Classification of Diseases) code that was submitted with the original order is on the facesheet. The radiology report is reviewed for the findings. The findings may not be identical to the ordering physician's medical reason to order the exam. The doctor may order a chest x-ray for a cough (786.50), for example, and the radiologist's report states pneumonia (486). So the code is changed to reflect the actual finding. The coder will use the ICD 9 software or in the ICD-9 code book to determine the best code that sends the message to Medicare, the medical reason for the exam. When reading the report the biller/coder will also need to verify the CPT code (Current Procedural Terminology) for the exam that was performed. In the chest x-ray report the radiologist will state single view chest, (71010) or two view chest, (71020). Radiology exams performed in the hospital will require a modifier with the CPT code to indicate professional services. The office work does not require a modifier. Radiology has over 660 CPT codes. The coders understand the report and will enter the correct procedural code on the insurance claim form. There are 1000s of diagnostic codes in the ICD 9 book. The experienced coder will find the appropriate ICD 9 that "matches" the procedure performed. The biller/coder determines that all of the line items are complete and correct. Even though we complete the form the physician is responsible for what is on it. When there are questions about the report or coding I am available to answer or assist in finding the information. Sometimes the radiologist may not have dictated all of the specific information that coders need. In these instances phone calls are made to a designated person in the hospital department or offices to find the correct answer. This may be immediate or may take time. When delays like this occur I suspend the claim until all information is completed. This process continues throughout the day. In the late afternoon the Medicare claims are sent electronically to a clearing house that submits directly to Medicare. Other insurances and Medicaid claims are sent electronically in the late afternoon. Click for more on billing clearinghouses. Statements are sent to the self-pay patients with instructions on how to pay the bill, numbers to call and a self-addressed envelope. Reports are generated by the biller to show all billing done today, dollar amounts generated and any additional financial reports requested. The Pathologist works within the hospital providing reports on surgical specimens. Patient demographics and reports are sent electronically to the billing office computers. I have one person assigned to pathology and I help if needed. There are up to 50 reports a day. As with radiology the report is reviewed for pathological findings to use the appropriate ICD 9 codes and procedure codes. Pathology CPT codes have a 26 modifier to indicate it is a professional component only. I will call the pathologist if I need clarification on a report. It is not uncommon for the pathologist to have non-specific findings and I will need to know how to code correctly. In the afternoon the insurance claims are sent electronically to Medicare and insurance companies. Statements are sent to the self-pay patients. An employee will sort the paper work from the offices by insurance type for each office. Medicare and Medicaid cover the largest number of patients. We can have up to 200 patients a day to bill. I have 6 employees dedicated to primary care billing and coding. All of the information is received on paper and all demographics have to be entered into the billing software. Usually the CPT and ICD codes are provided by the primary care practices; however we verify that the correct code is used for office visits and inpatient visits. Primary care has 140 CPT codes for usual services, more if the family practice provides OB coverage. My staff and I verify the location of services. Primary care has offices, hospitals nursing homes and home visits in their practice. This information has to be added to the claim form. All of the information and codes are entered into the claim form. When there are questions or missing information we contact the offices for clarification and will suspend the claim if we need to wait for the information. As with radiology and pathology the claims are sent electronically to Medicare and other insurance companies. Statements are sent to the self-pay patients. I have three employees dedicated to opening the mail from patients and insurance companies. The mail is sorted by physician group and then by payment and questions. Checks are clipped to the EOB (Explanation of Benefits) or RA (Remittance Advice). Once all the mail has been opened and sorted these employees begin posting payments to the patient's accounts. When the payment is posted to the accounts, I pick up the checks several times a day and deposit slips are completed for each practice and the checks are taken to the appropriate banks. I generally perform this job. I trust my employees but I am the one most responsible to get the money to the banks. We receive ERA (Electronic Remittance Advice) from Medicare and some of insurance companies for the physicians. The insurance companies do a few direct deposits to the physician's accounts. Deposit reports and financial reports are sent daily to the practice managers and/or physicians. After all of the posting is performed statements are sent to the patients and secondary insurances are billed. Then we review the questions and request for additional information correspondence. I have two employees that are bilingual, (English and Spanish) who answer the phones. These employees answer calls from patients with billing questions and concerns. They also answer calls from doctor's offices regarding billing questions. See this guide to phone etiquette for medical billers. These employees use the computer system to pull up the information to answer questions. They also enter new demographic information and insurance details so that we can rebill. There are always questions that need a higher level of expertise. If I'm available I will speak with the caller to resolve their questions. Messages are taken and someone will return those calls with the answer. Patients may not always be happy with the answer especially if there is out of pocket cost when insurance only pays part or none of the bill. Working with physicians and their money is a delicate balancing act. I keep everything above board making sure that all monies are deposited every day. I keep all of the deposits slips for each physician and deliver the deposit slips to them at the end of the week. At the end of each day reports are run that will provide all the doctors with detailed information of all of the billing performed. A daily payment report is also performed. Some of the doctors will request more specific reports. I am able to run reports on CPT codes and ICD 9 codes that are used daily, weekly, monthly and yearly. I can program most any request for demographics of the practice. All of this information is important to physicians for making informed decisions about their practices. I selected the software that is used in my billing company based on specific criteria. First and foremost is the ability to maintain absolute privacy and HIPAA regulations. I required a software that could be expanded as needed for additional billing accounts and the subsequent additional staff. The software must have the capability to receive and store information. Internet access is vital to submit claims, verify insurance coverage and receive information. The software must be upgradable and be able to expand for the coming ICD 10 changes. Want to learn how to choose the right software for you? See this guide. I must stay current with the advances in the computers and servers that I use. I need my employees to be able to be efficient. As the volume increases I will buy new computers and servers. I use an outside IT company to keep everything humming along. At the end of the day I verify that all claims have been submitted electronically or by United States mail. I make sure that all checks are deposited. All patient information on paper is locked in the vault at the end of the day. When all work is complete for the day I initiate the back-up to magnetic tape and to a separate hard drive. When this is complete the tape and hard drive are placed in the vault. Finally when the day is done and I am ready to leave I engage the security system and go home. We will start again tomorrow. Interested in working in medical billing? See whether this career is right for you, or see the options for education and certification. Like the idea of running your own billing company? Here's what it takes to get started.